The first part of this open canoe river trip can be found here. With Rab giving encouragement and instruction we decided to ‘go with the flow’, soon finding the perfect spot to practice our ‘Ferries’. We must’ve made an odd sight, our fleet constantly criss-crossing the fast moving water trying different combinations of angles, speed and paddle strokes to achieve the most efficient ferry glide. 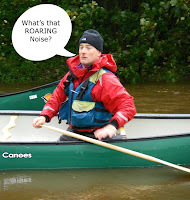 Colin and Bill, who have never paddled together before, soon realised that shouted communication is vital, particularly in noisy rapids. We had an anxious moment watching a high support stroke being performed. We needn’t have worried; we were amongst professionals! A surprised dog walker on the bank stated that he hadn’t seen canoes on this stretch before. ‘Mad Fools’, or wish ‘I could be with them’? We’ll never know as we sped round a bend through a bouncy wee rapid. We soon got the hang of breaking in and out, bow rudders, and hanging draws in the moving water. It was quite different from Drumkinnon Bay on a Tuesday night. The rain continued to pour down, the Endrick was in a 'state of spate'. We reached a section of rapid with some good waves. Colin and Bill sat perfectly balanced on the waves enjoying the pure buzz, no effort required to control the power. Everybody said it was a brilliant feeling. Rab was hooked…….it was difficult to stop him surfing! It became a competition to see who could be the surf star. Donald misjudged the angle, and shot downstream, there was much hilarity and no sympathy! .Young Davie and Ron judged it perfectly. The audience were getting cold (it was now only raining heavily) so we pressed on down a longer section of rapids. We made sure we avoided the shrubs and trees on the right bank. The banks of the River Endrick are looked after by a team of volunteers from the L.L.A.I.A who try to improve the fishing on the river. They inspect overhanging trees and trim when necessary. As anglers are restricted to fly only, it makes sense to remove branches which interfere with casting; it’s a great help to paddlers too, so thanks guys. And still the river rose………….and look, we’ve found another play spot: we jostled for the best wave. Colin and Bill saw Rab off this time; Janice and Davie enjoyed an adrenaline rush. Passing under the main A81 road bridge we were exposed to the full force of the wind. 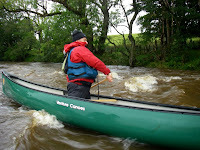 We realised that even in a river, windage is a very significant factor in open canoes. All too soon we were at the take out, just above Gartness Weir. The rain stopped, and some of us saw a kingfisher, which was a nice ending, but it’s not quite over until the boats are back on the cars……….. 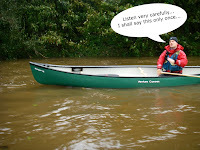 It was a great wee river in the conditions; Grade 1, with plenty of interest but no real difficulties for the paddlers. A highly recommended day out on a rising spate. Be aware that the best time for fishing on the Endrick is a falling river. Sometime after the last heavy downpour you will probably meet fishermen, in season. Remember the access code, it saves hassle. We took a short walk to look at ‘The Pots’ quite a famous salmon leap. Thanks Bill, its another great report on that day. 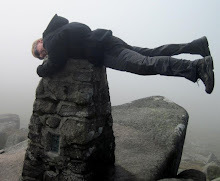 Funny, don't remember how wet and cold I felt - must have been too much fun! and as for the quip about professionals - of course we were.